Applications are invited from suitably qualified international students for scholarships to undertake the degree of Master by Research or Doctor of Philosophy at The University of Western Australia. Application for a scholarship is also an application for admission to the University. The purpose of the IPRS and the UWA SIRF scheme is to attract top quality international postgraduate students to areas in which the University has specialised research strengths and to support Australia`s research effort. Successful applicants can expect to become members of a research team working under the direction of senior researchers and in an area which has attracted external resources. These scholarships cover International Tuition Fees for up to four (4) years, as well as Overseas Student Health Cover. Successful applicants may also be awarded a full living allowance scholarship. Available in the IPRS/SIRF second application round for 2012. Applications will be assessed after the closing date. 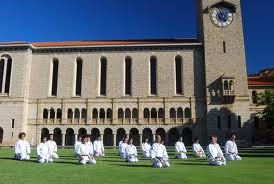 Scholarships can commence from 1 July 2012. Eligibility : Applications for international postgraduate research scholarships at UWA are rated according to the following criteria: (a) Academic achievement; (b) English language achievement; (c) Research training achievement; and (d) Proposed research environment. Demikianlah informasi International Postgraduate Research Scholarships (IPRS) at University of Western Australia kami sampaikan, semoga bermanfaat.